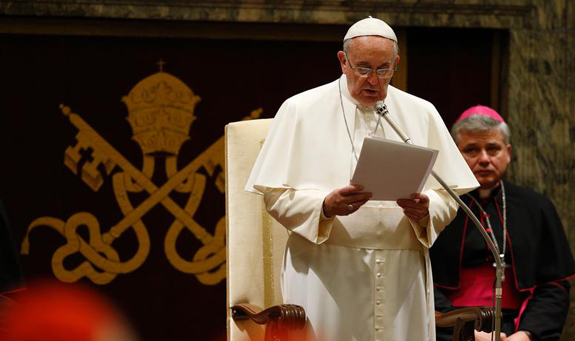 In this year’s Christmas address, the Holy Father called members of the Curia to “return to essentials,” offering a “catalogue of needed virtues for those who serve in the Curia and for all those who would like to make their consecration or service to the Church more fruitful,” particularly at the start of the Jubilee Year of Mercy. “May [mercy] also enable us to understand the littleness of all that we do in God’s greater plan of salvation and his majestic and mysterious working,” Francis said. Below, via Vatican Radio, is a translation of Pope Francis’ address delivered to the Curia today. I am pleased to offer heartfelt good wishes for a blessed Christmas and a happy New Year to you and your co-workers, to the Papal Representatives, and in particular to those who in the past year have completed their service and retired. Let us also remember all those who have gone home to God. My thoughts and my gratitude go to you and to the members of your families. In our meeting in 2013, I wanted to stress two important and inseparable aspects of the work of the Curia: professionalism and service, and I offered Saint Joseph as a model to be imitated. Then, last year, as a preparation for the sacrament of Reconciliation, we spoke of certain temptations or “maladies” – the “catalogue of curial diseases” – which could affect any Christian, curia, community, congregation, parish or ecclesial movement. Diseases which call for prevention, vigilance, care and, sadly, in some cases, painful and prolonged interventions. Some of these diseases became evident in the course of the past year, causing no small pain to the entire body and harming many souls. It seems necessary to state what has been – and ever shall be – the object of sincere reflection and decisive provisions. The reform will move forward with determination, clarity and firm resolve, since Ecclesia semper reformanda. It would be a grave injustice not to express heartfelt gratitude and needed encouragement to all those good and honest men and women in the Curia who work with dedication, devotion, fidelity and professionalism, offering to the Church and the Successor of Peter the assurance of their solidarity and obedience, as well as their constant prayers. Moreover, cases of resistance, difficulties and failures on the part of individuals and ministers are so many lessons and opportunities for growth, and never for discouragement. They are opportunities for returning to the essentials, which means being ever more conscious of ourselves, of God and our neighbours, of the sensus Ecclesiae and the sensus fidei. It is about this return to essentials that I wish to speak today, just a few days after the Church’s inauguration of the pilgrimage of the Holy Year of Mercy, a Year which represents for her and for all of us a pressing summons togratitude, conversion, renewal, penance and reconciliation. Christmas is truly the feast of God’s infinite mercy, as Saint Augustine of Hippo tells us: “Could there have been any greater mercy shown to us unhappy men than that which led the Creator of the heavens to come down among us, and the Creator of the earth to take on our mortal body? That same mercy led the Lord of the world to assume the nature of a servant, so that, being himself bread, he would suffer hunger; being himself satiety, he would thirst; being himself power, he would know weakness; being himself salvation, he would experience our woundedness, and being himself life, he would die. All this he did to assuage our hunger, alleviate our longing, strengthen our weaknesses, wipe out our sins and enkindle our charity”. Consequently, in the context of this Year of Mercy and our own preparation for the coming celebration of Christmas, I would like to present a practical aid for fruitfully experiencing this season of grace. It is by no means an exhaustive catalogue of needed virtues for those who serve in the Curia and for all those who would like to make their consecration or service to the Church more fruitful. 1. Missionary and pastoral spirit: missionary spirit is what makes the Curia evidently fertile and fruitful; it is proof of the effectiveness, efficiency and authenticity of our activity. Faith is a gift, yet the measure of our faith is also seen by the extent to which we communicate it. All baptized persons are missionaries of the Good News, above all by their lives, their work and their witness of joy and conviction. A sound pastoral spirit is an indispensable virtue for the priest in particular. It is shown in his daily effort to follow the Good Shepherd who cares for the flock and gives his life to save the lives of others. It is the yardstick for our curial and priestly work. Without these two wings we could never take flight, or even enjoy the happiness of the “faithful servant” (Mt 25:14-30). 2. Idoneity and sagacity: idoneity, or suitability, entails personal effort aimed at acquiring the necessary requisites for exercising as best we can our tasks and duties with intelligence and insight. It does not countenance “recommendations” and payoffs. Sagacity is the readiness to grasp and confront situations with shrewdness and creativity. Idoneity and sagacity also represent our human response to divine grace, when we let ourselves follow the famous dictum: “Do everything as if God did not exist and then put it all in God’s hands as if you did not exist”. It is the approach of the disciple who prays to the Lord every day in the words of the beautiful Universal Prayer attributed to Pope Clement XI: “Vouchsafe to conduct me by your wisdom, to restrain me by your justice, to comfort me by your mercy, to defend me by your power. To thee I desire to consecrate all my thoughts, words, actions and sufferings; that hencefore I may think only of you, speak of you, refer all my actions to your greater glory, and suffer willingly whatever you appoint”. 3. Spirituality and humanity: spirituality is the backbone of all service in the Church and in the Christian life. It is what nourishes all our activity, sustaining and protecting it from human frailty and daily temptation. Humanity is what embodies the truthfulness of our faith; those who renounce their humanity renounce everything. Humanity is what makes us different from machines and robots which feel nothing and are never moved. Once we find it hard to weep seriously or to laugh heartily, we have begun our decline and the process of turning from “humans” into something else. Humanity is knowing how to show tenderness and fidelity and courtesy to all (cf. Phil 4:5). Spirituality and humanity, while innate qualities, are a potential needing to be activated fully, attained completely and demonstrated daily. 4. Example and fidelity: Blessed Paul VI reminded the Curia of “its calling to set an example”. An example of avoiding scandals which harm souls and impair the credibility of our witness. Fidelity to our consecration, to our vocation, always mindful of the words of Christ, “Whoever is faithful in a very little is faithful also in much; and whoever is dishonest in a very little is dishonest also in much” (Lk 16:10) and “If any of you put a stumbling block before one of these little ones who believe in me, it would be better for you if a great millstone were fastened around your neck and you were drowned in the depth of the sea. Woe to the world for stumbling blocks! Occasions for stumbling are bound to come, but woe to the one by whom the stumbling block comes” (Mt 18:6-7). 5. Rationality and gentleness: rationality helps avoid emotional excesses, while gentleness helps avoid an excess of bureaucracy, programmes and planning. These qualities are necessary for a balanced personality: “The enemy pays careful heed to whether a soul is coarse or delicate; if it is delicate, he finds a way to make it overly delicate, in order to cause it greater distress and confusion”. Every excess is a symptom of some imbalance. 6. Innocuousness and determination: innocuousness makes us cautious in our judgments and capable of refraining from impulsive and hasty actions. It is the ability to bring out the best in ourselves, in others and in all kinds of situations by acting carefully and attentively. It consists of doing unto others what we would have them do to us (cf. Mt 7:12 and Lk 6:31). Determination is acting with a resolute will, clear vision, obedience to God and solely for the supreme law of the salus animarum (cf. CIC can. 1725). 7. Charity and truth: two inseparable virtues of the Christian life, “speaking the truth in charity and practising charity in truth” (cf. Eph 4:15). To the point where charity without truth becomes a destructive ideology of complaisance and truth without charity becomes myopic legalism. 8. Honesty and maturity: honesty is rectitude, consistency and absolute sincerity with regard both to ourselves and to God. An honest person does not act virtuously only when he or she is being watched; honest persons have no fear of being caught, since they never betray the trust of others. An honest person is never domineering like the “wicked servant” (cf. Mt 24:48-51), with regard to the persons or matters entrusted to his or her care. Honesty is the foundation on which all other qualities rest. Maturity is the quest to achieve balance and harmony in our physical, mental and spiritual gifts. It is the goal and outcome of a never-ending process of development which has nothing to do with age. 9. Respectfulness and humility: respectfulness is an endowment of those noble and tactful souls who always try to show genuine respect for others, for their own work, for their superiors and subordinates, for dossiers and papers, for confidentiality and privacy, who can listen carefully and speak politely. Humility is the virtue of the saints and those godly persons who become all the more important as they come to realize that they are nothing, and can do nothing, apart from God’s grace (cf. Jn 15:8). 10. Diligence and attentiveness: the more we trust in God and his providence, the more we grow in diligence and readiness to give of ourselves, in the knowledge that the more we give the more we receive. What good would it do to open all the Holy Doors of all the basilicas in the world if the doors of our own heart are closed to love, if our hands are closed to giving, if our homes are closed to hospitality and our churches to welcome and acceptance. Attentiveness is concern for the little things, for doing our best and never yielding to our vices and failings. Saint Vincent de Paul used to pray: “Lord, help me to be always aware of those around me, those who are worried or dismayed, those suffering in silence, and those who feel alone and abandoned”. 11. Intrepidness and alertness: being intrepid means fearlessness in the face of troubles, like Daniel in the den of lions, or David before Goliath. It means acting with boldness, determination and resolve, “as a good soldier” (2 Tim 2:3-4). It means being immediately ready to take the first step, like Abraham, or Mary. Alertness, on the other hand, is the ability to act freely and easily, without being attached to fleeting material things. The Psalm says: “if riches increase, set not your heart on them” (Ps 61:10). To be alert means to be always on the go, and never being burdened by the accumulation of needless things, caught up in our own concerns and driven by ambition. 12. Trustworthiness and sobriety: trustworthy persons are those who honour their commitments with seriousness and responsibility when they are being observed, but above all when they are alone; they radiate a sense of tranquillity because they never betray a trust. Sobriety – the last virtue on this list, but not because it is least important – is the ability to renounce what is superfluous and to resist the dominant consumerist mentality. Sobriety is prudence, simplicity, straightforwardness, balance and temperance. Sobriety is seeing the world through God’s eyes and from the side of the poor. Sobriety is a style of life which points to the primacy of others as a hierarchical principle and is shown in a life of concern and service towards others. The sober person is consistent and straightforward in all things, because he or she can reduce, recover, recycle, repair, and live a life of moderation. Mercy is no fleeting sentiment, but rather the synthesis of the joyful Good News, a choice and decision on the part of all who desire to put on the “Heart of Jesus” and to be serious followers of the Lord who has asked us to “be merciful even as your heavenly Father is merciful” (Mt 5:48; Lk 6:36). In the words of Father Ermes Ronchi, “Mercy is a scandal for justice, a folly for intelligence, a consolation for us who are debtors. The debt for being alive, the debt for being loved is only repayable by mercy”. And so may mercy guide our steps, inspire our reforms and enlighten our decisions. May it be the basis of all our efforts. May it teach us when to move forward and when to step back. May it also enable us to understand the littleness of all that we do in God’s greater plan of salvation and his majestic and mysterious working. and to see things from a distance. The Kingdom is not only beyond our efforts, it is also beyond our visions. of the marvellous plan that is God’s work. which is to say that the Kingdom is greater than ourselves. No statement says everything that can be said. No prayer completely expresses the faith. No pastoral visit solves every problem. No programme fully accomplishes the mission of the Church. No goal or purpose ever reaches completion. knowing that others will watch over them. We lay the foundations of something that will develop. We add the yeast which will multiply our possibilities. yet it is liberating to begin. This gives us the strength to do something and to do it well. It may remain incomplete, but it is a beginning, a step along the way. and to do the rest. but that is the difference between the master and the labourer. We are prophets of a future that does not belong to us. 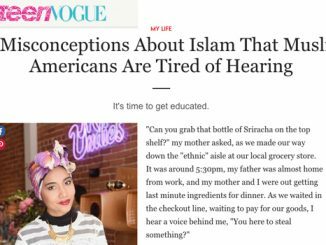 Is the Truth About Islam in Vogue?